Cement production is one of the most energy-intensive and highest carbon dioxide (CO2) emitting manufacturing processes in the world: On its own, the cement industry accounts for more than 5 percent of global anthropogenic CO2 emissions. California is the second-largest cement producing state in the United States after Texas. California’s nine cement plants together produced about 10 million metric tonnes (Mt) of cement and emitted 7.9 Mt of GHG emissions in 2015. California’s cement factories are the largest consumers of coal in the state. Global Efficiency Intelligence, LLC conducted a study supported by the Sierra Club and ClimateWorks Foundation to analyze the current status of cement and concrete production in California, and benchmarks the energy use and GHG emissions of the state’s cement industry in comparison to other key cement-producing countries. The result of our benchmarking analysis shows that California’s cement industry has the second highest electricity intensity and fuel intensity among 14 countries/regions studied. To read the full report and see the complete results and analysis, download the report from this link. The chemical and petrochemical industry is the largest consumer of energy among industrial sectors and is one of the top GHG emissions-intensive industries as well. 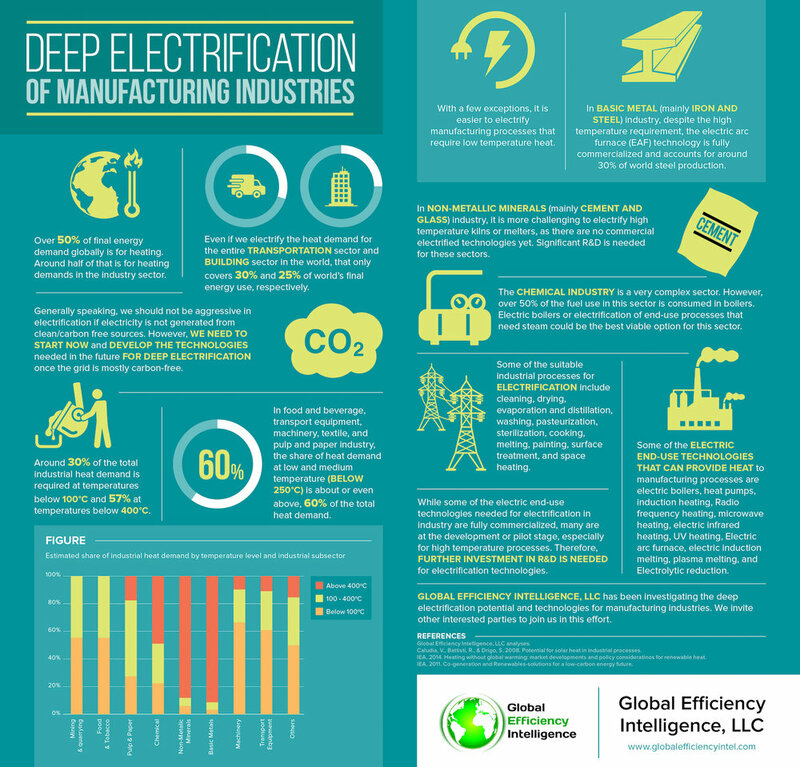 The infographic below is prepared by Global Efficiency Intelligence, LLC to summarize some key information on energy use and emissions in the chemical industry. Glass production is a highly energy-intensive industrial process. The container and flat glass industries (which combined account for 80% of glass production) emit over 60 million tonne of CO2 emissions per year. The global increase in glass consumption and production will drive significant growth in the industry’s absolute energy use and GHG emissions. Studies have documented the potential to save energy by implementing commercially-available energy-efficiency technologies and measures in the glass industry worldwide. However, today, given the projected continuing increase in glass production, future reductions (e.g., by 2030 or 2050) in absolute energy use and GHG emissions will require further innovation in this industry. Innovations will likely include development of different processes and materials for glass production or technologies that can economically capture and store the industry’s GHG emissions. The development of these emerging technologies and their deployment in the market will be a key factor in the glass industry’s mid- and long-term climate change mitigation strategies. Many studies from around the world have identified sector-specific and cross- energy-efficiency technologies for the glass industry that have already been commercialized. However, information is scarce and scattered regarding emerging or advanced energy-efficiency and low-carbon technologies for the glass industry that have not yet been commercialized. In 2017, Cecilia Springer of Lawrence Berkeley National Laboratory and I wrote a report that consolidated available information on emerging technologies for the glass industry with the goal of giving engineers, researchers, investors, glass companies, policy makers, and other interested parties easy access to a well-structured database of information on this topic. The information about the 16 emerging technologies for the glass industry was covered in the report and was presented using a standard structure for each technology. Table below shows the list of the technologies covered. 1. Springer, Cecilia and Hasanbeigi, Ali (2016). Emerging Energy Efficiency and Carbon Dioxide Emissions-Reduction Technologies for the aluminum Industry. Berkeley, CA: Lawrence Berkeley National Laboratory. 3. Hasanbeigi, Ali; Arens, Marlene; Price, Lynn; (2013). Emerging Energy Efficiency and CO2 Emissions Reduction Technologies for the Iron and Steel Industry. Berkeley, CA: Lawrence Berkeley National Laboratory BNL-6106E. 4. Kong, Lingbo; Hasanbeigi, Ali; Price, Lynn (2012). Emerging Energy Efficiency and Greenhouse Gas Mitigation Technologies for the Pulp and Paper Industry. Berkeley, CA: Lawrence Berkeley National Laboratory. LBNL-5956E. 5. Hasanbeigi, Ali; Price, Lynn; Lin, Elina. (2012). Emerging Energy Efficiency and CO2 Emissions Reduction Technologies for Cement and Concrete Production. Berkeley, CA: Lawrence Berkeley National Laboratory LBNL-5434E. Springer, Cecilia; Hasanbeigi, Ali and Price, Lynn (2017). Emerging Energy Efficiency and CO2 Emissions Reduction Technologies for the glass Industry. Berkeley, CA: Lawrence Berkeley National Laboratory. President Trump just signed an executive order to impose a 25% tariff on steel imports and 10% on aluminum imports to the U.S. While many people are discussing how this can lead to a trade war between certain nations, we decided to take a look at it through the lens of embodied carbon in traded goods. The UNFCCC’s greenhouse gas (GHG) accounting system works on the basis of national production rather than consumption of emissions. This means that when goods are traded, their embodied emissions (e.g. emissions associated with manufacture) are also traded. However, these imported emissions are not counted towards a country’s reported climate impacts. It is estimated that around 25% of global CO2 emissions comprise goods and services which have been internationally traded. In the recent study on Embodied Carbon in Globally Traded Goods funded by the ClimateWorks Foundation, Global Efficiency Intelligence, LLC. and KGM & Associate Ltd. use the most recent available data and a cutting-edge model to conduct a global assessment of the extent of the embodied carbon in globally traded goods, so-called carbon loophole. In addition, we have conducted a series of higher-resolution, deeper dive case studies into a few key sectors and geographies of most importance, including steel and cement. The infographic below summarizes some of our key findings related to deep-dive analysis we conducted for embodied carbon in global steel and cement trade. As it is illustrated, steel trade accounts for a significant amount of embodied carbon in trade. Even though China doesn’t feature in the top three steel import sources for the United States (Canada, Brazil, and South Korea occupy the top three spots), China still accounts for 40% of carbon embodied in the global commodity steel extra-regional trade, and 27% of carbon embodied in overall commodity steel trade. One of the frustrations of U.S. steelmakers, which led to their support of the U.S. tariff, was China systematically overproducing subsidized steel and flooding the international markets. Furthermore, many steel manufacturers in China and other steel exporting countries like the Commonwealth of Independent States (CIS) produce a comparable unit of steel using significantly more carbon and energy than their cleaner counterparts in their own country or region. We see this disparity of carbon use in production not only in countries like China but also within different states in the U.S.
A tool like the U.S. tariff on steel imports could be good for the climate and the economy if it was based on the carbon footprint of the steel imported and was not just implemented as a blanket tariff. In fact, California recently passed the Buy Clean legislation (AB 262), which calls for the state to create rules for the procurement of infrastructure materials (including steel) purchased with state funds that take into account pollution levels during production. This could be an example of environmental- and climate-friendly procurement and trade tariffs that level the playing field and can benefit both industry and the environment and incentivize high polluting companies that are out-of-state or out-of-country to clean up their production in order to be able to trade with these states or countries. The study on Embodied Carbon of Globally Traded Goods will be published in September 2018. Also, read our other blog posts and projects related to energy use and GHG emissions in the steel and cement industry from this link. President Trump just suggested to impose a 25% tariff on steel imports. While there are mix reactions to this announcement and many say it can lead to a trade war, I thought to look at it from climate change point of view. Is a U.S. tariff on steel imports good for the climate? The answer is it depends on where we are importing steel from. I will discuss this in more details below. According to USGS, U.S. imported around 36 million ton of steel in 2017, which equals to about 43% of total steel production in the U.S. that year. Iron and steel production is an energy and carbon dioxide (CO2) intensive manufacturing process. Two types of steel production dominate the industry: blast furnace/basic oxygen furnace (BF/BOF) and electric arc furnace (EAF) production. BF/BOF production uses iron ore to produce steel. The reduction of iron ore to iron in a BF is the most energy-intensive process within the steel industry. EAF production re-melts mainly scrap to produce steel. BF/BOF production is more energy intensive and emits more GHG than EAF production. A few years ago, when I was working at Lawrence Berkeley National Laboratory, I led a study to compare the CO2 intensity of steel production in four major steel producing countries: China, Germany, Mexico, and the U.S. We defined a similar boundary for the steel industry in these countries and adjusted the CO2 intensity based on net import of fuel and intermediary products (e.g. net imported pig iron, direct-reduced iron (DRI), pellets, lime, oxygen, ingots, blooms, billets, and slabs). The result of our study is presented in the graph below. More results and scenario analysis can be found in the report we published (see link at the bottom). Our analysis used 2010 data because that was the latest year for which the data were available for all four countries at the time of the study. As can be seen from the Figure above, China has the highest and Mexico has the lowest total steel industry CO2 intensity. The total CO2 intensity of the Chinese steel industry is almost twice that of the Mexican steel industry. Two main reasons for low total CO2 intensity in Mexico’s steel industry are: a) Mexico has the largest share of EAF steel production among the four countries studied (69% in 2010), and b) Mexico’s steel industry consumes a larger share of natural gas compared to that in other countries studied. This results in a lower average emissions factor for fuels in Mexico. Another interesting point to note is that the total CO2 intensity of the German steel industry is 2% lower than that of the U.S. which is remarkable given that, in 2010, Germany had a lower share of EAF steel production (30% of total production) than the U.S. (61% of total production). However, it should be noted that the U.S. steel industry would have had lower CO2 intensity if we had not adjusted for net import of intermediary products to the steel industry, but that would have not been an accurate comparison. Our analysis also showed that the CO2 intensity of BF/BOF steel production alone in the U.S. is significantly higher than that in other three countries. This could be because of various reasons such as older BF/BOF plants and lower penetration of some major energy efficiency technologies such as coke dry quenching (CDQ) and top-pressure recovery turbine (TRT) in blast furnaces, etc. Some of the key factors influencing the CO2 intensities of the steel industry are: share of EAF from total steel production, the age of steel manufacturing facilities in each country, the level of penetration of energy-efficient technologies, the scale of production equipment, the fuel shares in the iron and steel industry, the steel product mix in each country, the CO2 emissions factor of electricity grid, etc. Figure below shows the Top 10 countries from which U.S. imported steel in 2014. Even though our aforementioned study did not include all the countries from which U.S. imports steel, many of them are known for having low energy and carbon intensive steel industry and/or having high EAF steel production share, which helps to reduce the CO2 intensity of their entire steel industry. Figure below shows the share of EAF steel production (one of the key factors influencing overall CO2 intensity of the steel industry in a country) in top 10 counties from which U.S. imports steel. It worth mentioning that U.S. also exported around 11 million ton of steel in 2017, around 90% of which went to Canada and Mexico. In fact, even though Canada and Mexico are among top countries from which U.S. imports steel, U.S. export more steel to Canada and Mexico than imports from them. Therefore, imposing steel import tariffs for these two countries does not seem to be effective. To sum up, the U.S. tariff on steel imports can be good for the climate if it is based on carbon footprint of the steel imported and not just a blanket tariff. In fact, state of California recently passed a Buy Clean regulation, which calls for the state to create rules for the procurement of infrastructure materials (including steel) purchased with state funds that take into account pollution levels during production. It was one of the rare cases where both environmentalist and industry advocates agreed and backed the regulation. This could be an example of environmental- and climate-friendly procurement and trade tariffs that can benefit both industry and the environment and incentivize high polluting companies that are out-of-state or-country to clean up their production in order to be able to trade with these states or countries. Needless to say, an import tariff on steel could result in a major trade war that will include other industrial sectors and products. More details of our steel industry CO2 intensity comparison analysis and results are presented in the report that is published on LBNL’s website and can be downloaded from this Link. The cement industry accounts for over 5 percent of current man-made carbon dioxide emissions worldwide. World cement demand and production are increasing; annual world cement production is expected to grow from approximately 4,100 million tonnes (Mt) in 2015 to around 4,800 Mt in 2030 and grow even further after that. The largest share of this growth will take place in developing countries, especially in the Asian continent. According to USGS, United States produced around 86 Mt of cement in 2016 making it the third largest cement producer in the world after China and India. The state of California has 10 cement plants that together produced around 10 Mt of cement in 2015 making it the second largest cement producing state in the U.S. after Texas. This significant cement production in California is associated with a substantial energy use and greenhouse gas (GHG) emissions in the state. The cement industry in California is the largest consumer of coal in the state. Therefore, there is a need to develop a roadmap on how to reduce energy use and GHG emissions related to cement and concrete production in California. Given our extensive experience in this area, Global Efficiency Intelligence, LLC is conducting a study for the Sierra Club to develop a roadmap for decarbonizing California’s cement and concrete industry. In this study, we will look into current status of the cement and concrete production in California and conduct a benchmarking analysis for the energy use and emissions of the cement industry in California in comparison with some other key cement producing countries. In addition, we will look into options that can help to decarbonize the cement and concrete production in California such as energy efficiency, fuel switching, alternative raw material and products, and carbon capture, utilization, and storage (CCUS). Globalization has resulted in substantial increase in global trade of goods and services across countries around the world. Often, goods are produced in developing countries where labor cost is lower, and developed countries are often net importers. The UNFCCC’s greenhouse gas (GHG) accounting system works on the basis of national production rather than consumption of emissions. This means that when goods are traded, their embodied emissions (e.g. emissions associated with manufacture) are also traded. However, these imported emissions are not counted towards a country’s reported climate impacts. It is estimated that around 22% of global CO2 emissions comprise goods and services which have been internationally traded. Better understanding and providing solutions to address the embodied carbon of traded goods will be critical in global and national efforts to decarbonize industry. In addition, large and multinational companies are paying more attention to the energy and carbon footprint of their supply chain. Also, with higher consumer awareness, end users of products are also paying increasing attention to energy and carbon footprint of the goods they use. Global Efficiency Intelligence, LLC. has partnered with the ClimateWorks Foundation and KGM & Associate Ltd. to use the most recent available data and a cutting-edge model to conduct a global assessment of the extent of the embodied carbon in globally traded goods, so-called carbon loophole. In addition, we will conduct a series of higher-resolution, deeper dive case studies into a few key sectors and geographies of most importance. The report of this study is expected to be published in the spring of 2018.